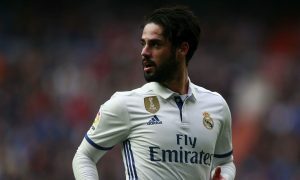 Manchester City have NO interest in signing long-term love interest target Isco from Real Madrid despite recent rumours, Catalan newspaper SPORT reports. This backs up similar information from Stuart Brennan of the Manchester Evening News and contradicts claims from both Spanish journalist Jorge Calabrés on El Chiringuito TV and a report in England’s Daily Mirror. Not only is Pep Guardiola not pursuing the 25-year-old playmaker, but City sources have informed SPORT that the club has not made any offer for Isco nor are they even considering incorporating him into their squad this summer. City management are already working on squad plans for next season and are expected to bring in at least two major signings, but Isco will not be one of them. In addition to a holding midfielder for the ‘6’ role, Guardiola wants to add another wide man with goals in his locker, and a renewed offer for Riyad Mahrez is a possibility, while Bayer Leverkusen starlet Leon Bailey is also on Guardiola’s list as City Watch exclusively revealed in February.